Whaling in the Marlborough Sounds from the 1830s. Sealing and whaling in the Southern Ocean, sailing from New South Wales to New Zealand, Te Rauparaha’s battles with Ngāi Tahu, Jacky Guard and his Port Underwood and Kaikoura whaling stations. Te Ātiawa, Ngāti Toa, Ngāi Tahu and Rangitane history, the seige of Ngāmotu, New Zealand Company settlements, the naming of Pelorus Sound and Tory Channel, Picton fish factories and the Perano whalers, family life at Te Awaiti, Campbell Island whalers, Queen Charlotte Sound and early Marlborough history. Patrick Norton was 20 years old when he appeared before the judge at County Galway on a charge of theft. Convicted and sentenced, he was transported to New South Wales in 1810 and never returned to his native Ireland. 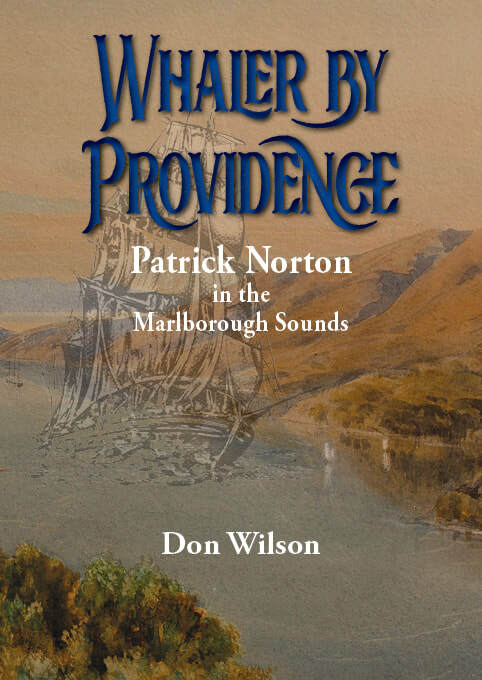 This detailed and meticulously-researched narrative describes the seven-month voyage of the convict ship Providence from Cove of Cork to Sydney Harbour, the serving out of Norton’s seven-year sentence and his career as a sailor and whaler. He crewed on coastal trading vessels, faced the dangers of the southern ocean on sealing ships and then became a pioneer settler and shore whaler at Te Awaiti in the Marlborough Sounds. A decade before the Treaty of Waitangi was signed, legendary whalers such as Patrick Norton, James Heberley, Jacky Guard, Joseph Thoms, William Keenan, John Love and Jimmy Jackson lived and worked with Māori under the fierce control of Ngāti Toa chief Te Rauparaha. Author Don Wilson, who descends from Patrick and Tangitu Norton and other Te Awaiti pioneers, traces their life and times and those of their descendants, the grandsons who went whaling at Campbell Island and fought in World War One and the great grandson who harpooned the last whale in 1964.